Spanish cuisine is an exciting mix of savoury, juicy flavours and textures that makes the mouth water simply at the thought. 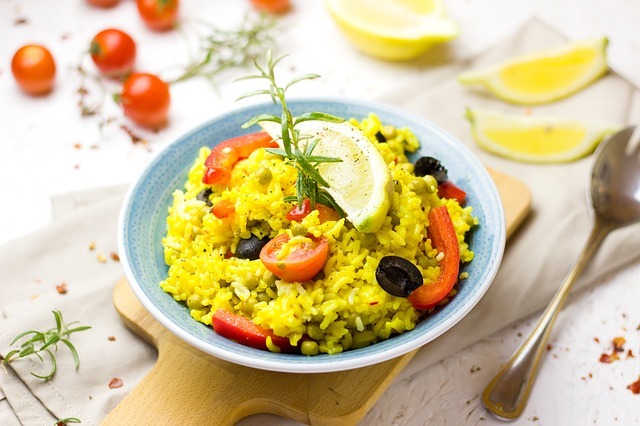 Paella, the signature dish of the Valencia region is no exception to this, offering a versatile mix of serving options that are sure to wet any appetite. In fact the versatility of this dish is what makes it such a popular dining choice, with paella catering services becoming a common site at events and functions of different sizes. With the base ingredients of rice, saffron, stock and the soffrito flavour mix, there’s a big canvas for chefs to work with that allows for multiple variations of the dish. The following will go into detail about some of the most popular servings of Spanish paella. This meat-lovers’ Spanish rice dish includes a mix of chicken thigh and chorizo sausage. It is served with a base of chicken stock alongside peas and tomatoes. This version of the dish is the quintessential choice for regular meat eaters and is sure to fill diners up very fast. Although not normally served with lemon, caterers will usually provide some if asked for it. This version of the dish is passed down from Valencians living on the Mediterranean coast that primarily relied on fishing to get their sources of protein. Despite being born of necessity this variation is considered one of the most authentic servings of the dish. A juicy mix of prawns, muscles, salmon and squid make up the primary ingredients. This dish is served on a base of fish stock with lemon and parsley thrown into the pan. The seafood option is one of the most popular choices for paella catering. Not to forget about the vegetarians amongst us, there is a marvellous serving of the dish that forgoes any need for meat products. This variation is served with capsicum, peas, tomatoes, asparagus, mushrooms and parsley all supported by a vegetable stock. This comprehensive vegetarian offering hammers home just how versatile this rice dish can be for any type of crowd. Everyone at a party will be satisfied when there is some equally delicious vegetarian paella on the table. The versatility of the dish is not just evident in its standardised variations but in the ability of chefs to mix and match ingredients. This allows diners to choose between delicious combinations of existing menu items or customise their own experience. A popular choice mixes chicken, chorizo and seafood together in a surprisingly delightful assault of flavours that won’t be soon forgotten. Diners can also create their own dishes incorporating a huge variety of compatible ingredients that is a rare offering in other cuisines. These are the most popular variations of the dish although there are a near limitless amount of combinations that are possible. This level of versatility is a core reason why paella catering has become such a popular dining solution for a huge variety of events, big and small.